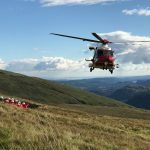 A group of 7 Duke of Edinburgh students were caught in bad weather on Crag Hill with one of them succumbing to mild hypothermia. The group did a good job in supporting each other and made a shelter with one of their tents. 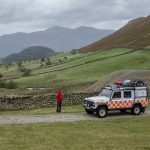 With help from a passing walker they then made their own way down to Coledale Hause and on towards Force Crag Mine where they met Keswick MRT who assessed their condition. Although some were still cold, a change into dry clothing lifted their spirits and they continued on to Braithwaite to meet their supervisor.